Sometimes when I can’t sleep at night, I find myself lying in bed, looking at the ceiling, and thinking about completely geeky things like “how long would it take the Enterprise to get to Alpha Centauri from Earth? Would that be faster or slower than the Millennium Falcon?” Clearly, this is a sign that I need a life, or at least sleeping pills. However, it turns out that I’m not alone in wondering about these things – Chris Kirk over at Slate spends a lot of time thinking about the same things. The difference? 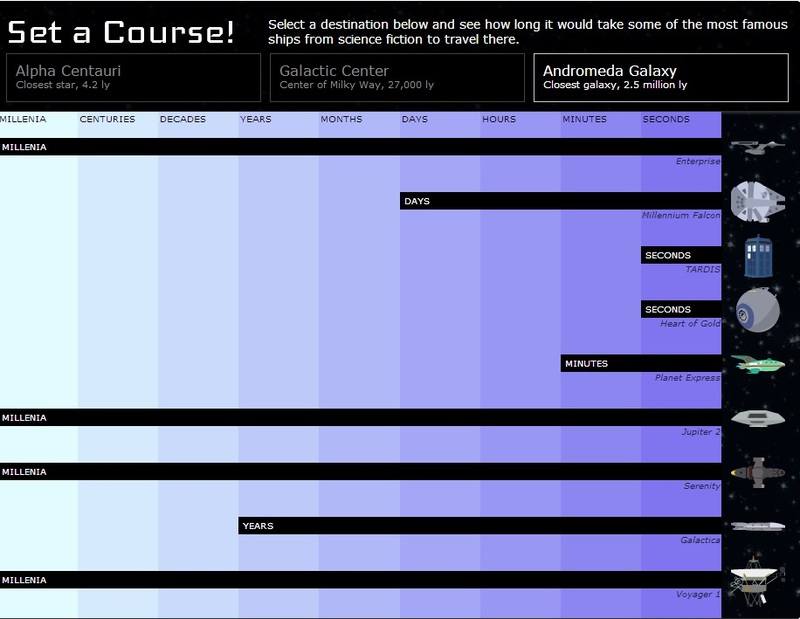 He didn’t just think about it instead of counting sheep – he made a cool interactive chart that shows just how fast some of sci-fi’s most famous ships are and how long it would take them to cover some incredible distances. Kirk (and how ironic is it that he shares a last name with the greatest Starfleet captain in history? That’s right – his last name certainly isn’t Picard) has rounded up the A-list of sci-fi starships – everything from the Enterprise to TARDIS – and through extensive research (which probably involved watching a lot of great TV and movies) he’s figured out roughly how fast each one travels at top speed. The results are interesting. No one should be surprised that Dr. Who’s TARDIS or the Heart of Gold can get to the farthest reaches of the galaxy in seconds, but did you know that for all of the Star Trek talk about warp speed that it would actually take the Enterprise millennia to reach the Andromeda galaxy (2.5 million light years away)? The Futurama gang make the trip in minutes, while Han Solo and Chewie would spend days in transit. The Galactica takes years complete the voyage. Some of the other slower vessels include Firefly’s Serenity (which makes sense), and Lost in Space’s Jupiter 2. They’re in the millennia range as well. Just to add a dose of reality to the proceedings, Kirk has included the Voyager 1 space probe for comparison. The results are not heartening. The Voyager, launched back in 1977, is the slowest by far. It would take millennia for that space vehicle to reach Alpha Centauri, which is just 4.2 light years away. It's the Yugo of space travel. Check out the chart over at Slate – and be sure to bookmark it as conclusive evidence the next time you have a debate with someone about the fastest star ships in the universe.